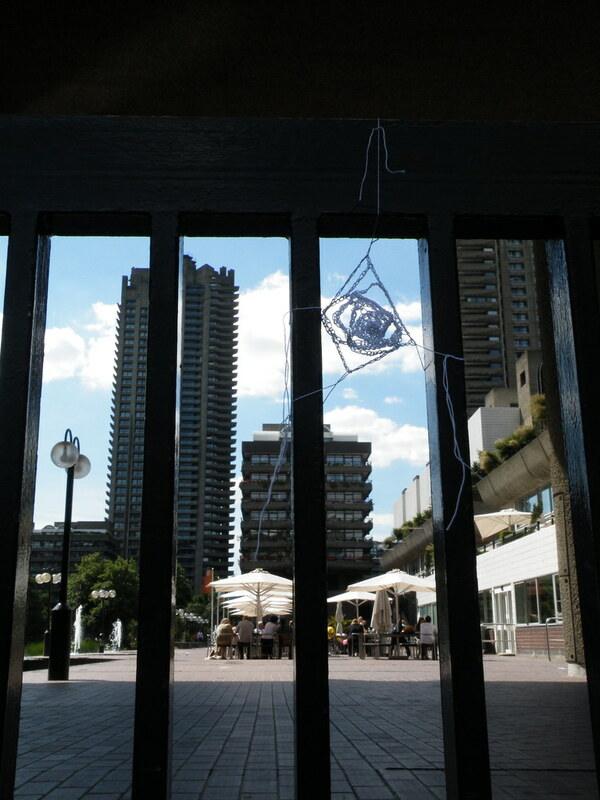 You may have noticed the Barbican popping up with some regularity in my (irregular) posts. 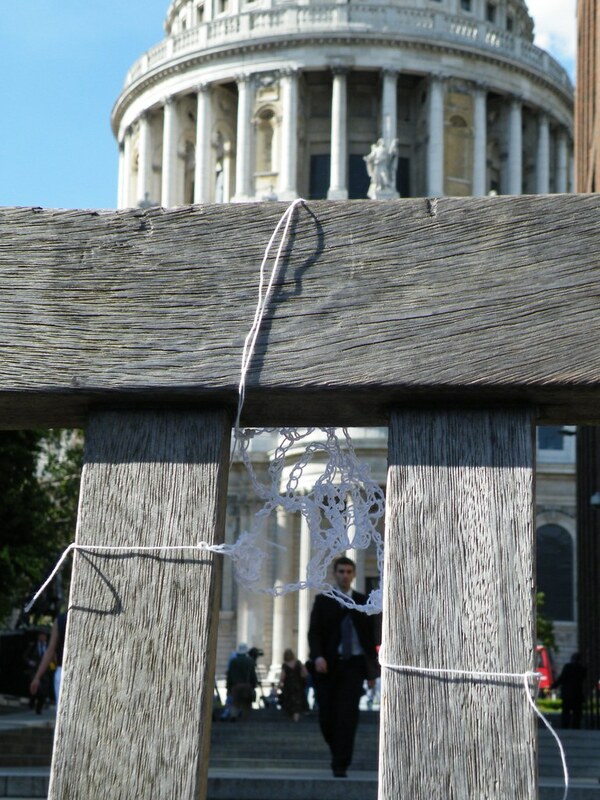 The first one, upon my discovery of this area was in connection to walking the Roman Wall in the City of London. The second involved a sunny day, magazine ideas, baby ducks, and a lovely friend. It has also been involved in my reCLAIMation project. Basically, this area is tied to my life in London. So many great things have happened there and it’s kind of punctuated the past few months. Also, it is a wonderful napping spot! From this, I’ve spent a lot of time thinking about not only what the Barbican means to me, but in it’s greater context within the City and just what were they getting at, and trying to convey at putting this utopian residential area right in the middle of the commercial hub of London. Generally, getting into the Barbican is a giant pain. The entrances are kind of hidden (to me) and I seem to walk around the complex for a very long time before actually finding a way in! So after arriving near to the Barbican, hearing all the city noises, the city smells, the busy people, the busy traffic, the completely overwhelming, noisy, amazing din that is London and then the frustration of finding a way in, upon entering the Barbican, you hear almost nothing. It’s so quiet. There are trees, a lovely water feature/lake, a church, and bits of the Roman wall to boot! There are little islands in the middle of the lake, little areas that jutt out into the water (and make a perfect spot to nap, have lunch, lounge in the sun, etc.) However, the quiet and loveliness is contrasted sharply with the brutalist architecture of the surrounding buildings, both residential and otherwise. 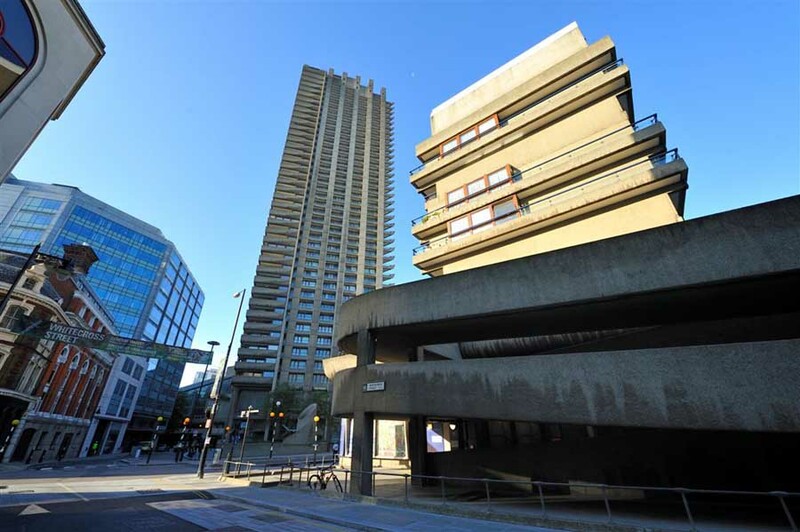 What the Barbican is really known for is its cultural projects. It puts on theater, art exhibitions, and many other things. It’s a place to live as well, with its high, iconic towers undoubtably providing the best views of London pre-London Eye. (And maybe even now, the Eye isn’t that great!). It puts on shows that are interesting, smart, and not quite the usual, whilst still appealing to many (well at least to me, maybe I’m projecting my interests on to too many people!). The initial juxtaposition of its ideal, utopian setting with a girl’s school, a lovely little church, and greenery is in stark contrast to the super masculine, business-oriented, high-speed life of the City around it. 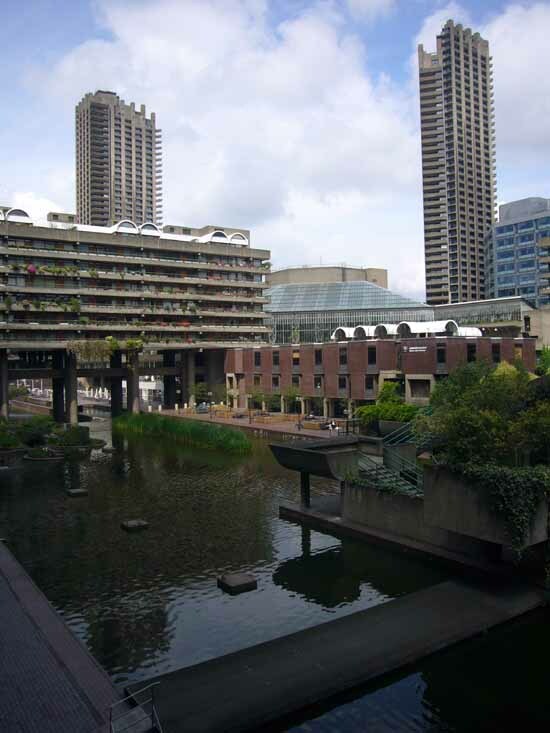 What is the Barbican on the whole communication to and about the City, it’s immediate surroundings? They seem at odds with each other. Art vs. Money. 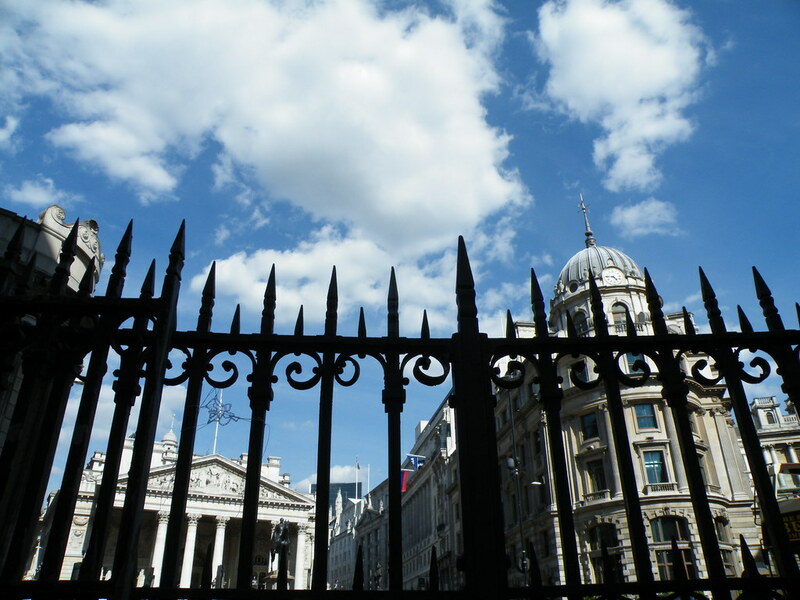 Theater vs. the Royal Stock Exchange. Ducklings vs. the Bank of England. The reality of it is though, these nasty bankers provide some of the funds for the Barbican to run. 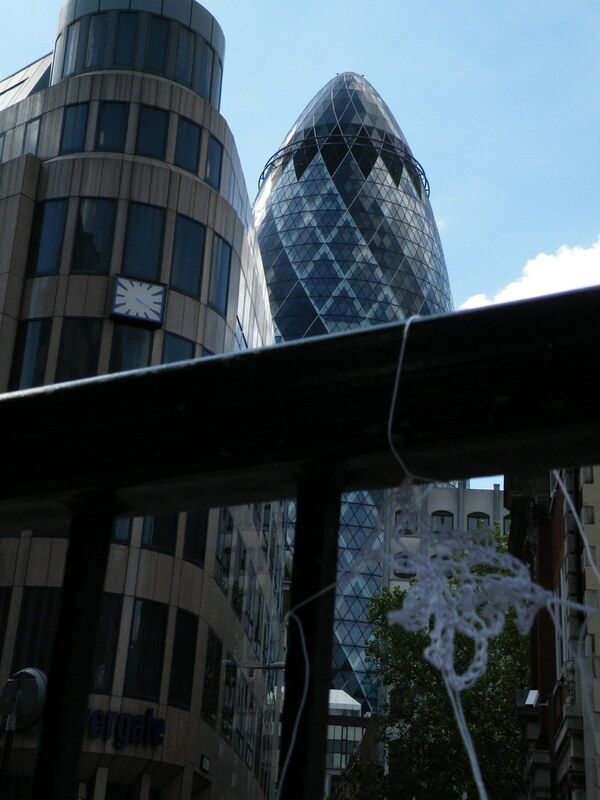 Instead of a juxtaposition with the City, is it a justification of it? A complex full of hypocrosies and questions. A complex complex of brutalist architecture and art and human lives in a constantly changing city noted for it’s own juxtapositions and hypocrosies. Graffiti is rather like marking your territory. It’s leaving a mark for others to find and identify with or against. But for the maker and the finder, it’s a bit like a conversation. For me, it’s identifying myself and claiming my existence in a city that can seem very cold and one in which I rarely feel like I belong. And I hope for the finder, they feel less alone. Alex noted that one thing that’s nice about this project is that each piece is a little out of the way, a little out of sight. So the people who are more likely to see it, are more likely to enjoy it. Serendipity.